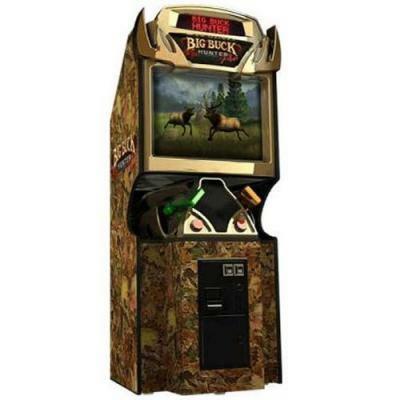 Play hunting arcade games at home! Several models available, like the hunting coin-operated machines that you loved to play at the arcades. Embark on a hunting trip of a lifetime with Extreme Hunting 2 Tournament Edition, the second, and better than ever, installment of the Extreme Hunting Franchise. A choice of the most prestigious North American wild game a hunter could ask for including Bison, Bear, Moose, Elk, Deer, and Wolf along with bonus stages featuring Bass, Goose, Bat, Squirrel and more. Dont miss the chance to play our ever-changing Special Hunts. Play to uncover the secrets. 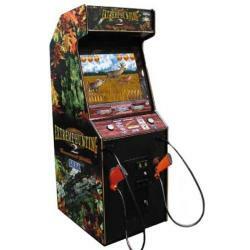 Pump your shotgun, take aim at the gathered wildlife, and hope for a nice, clean headshot in the Big Buck Hunter Pro. This revolutionary hunting simulator features fully rendered 3-D Whitetail Deer, Elk, Prong Horn Antelope, more in amazingly detailed landscapes. A sure shot will earn you fast paced bonus rounds where you can shoot up scurrying squirrels, rabbits, and even ducks.